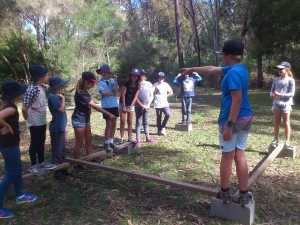 The Leadership program is designed for Stage 3 students and focuses on activities that require cooperation, team work and building positive relationships. Students work through a number of challenges and reflect on what they have learnt throughout the day. 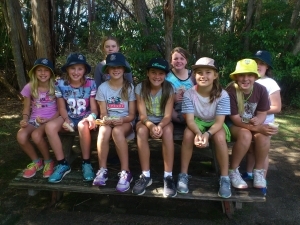 While many of the programs listed below are run at Bournda National Park, the program can be adapted to be run at your school. Challenge Games are a series of challenging activities that require team work and cooperation to be successfully completed. Students work in groups to solve challenging problems using creative thinking, problem solving and team work. Each game has a set of rules that the students must follow. 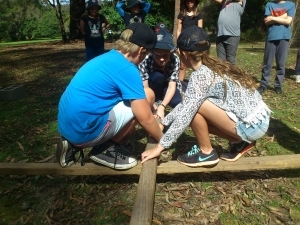 Aspects of leadership, team work and perseverance are discussed with students as they complete the challenges. 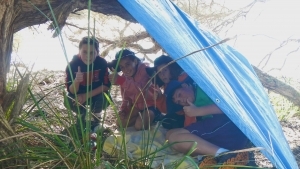 Bushcraft Survival challenges are designed so that students co-operate as part of a small group to select and utilise a variety of equipment to simulate an overnight camping experience with limited gear. Students are required to use a compass, create a shelter, deal with a first aid scenario and show how they would cope with a variety of different weather conditions. Amazing Race Treasure Hunt involves students working in small groups and taking turns at a leadership role. Students must navigate their way through the amazing race using a map and compass and solve a problem at each location they reach. They record their answers and points are awarded to teams at the end of the race. Strengths Orienteering students work together to complete an orienteering course and discover ‘strength’ cards along the way. They use the strengths cards to complete puzzles and compile a complete list of the 24 character strengths. Discussion students are guided through a series of questions that reflect on what they have learnt about leadership, working in a group and respecting others.